This post is linked to Simply Sugar and Gluten Free’s Slightly Indulgent Tuesdays , The Gluten-Free Homemaker’s Gluten Free Wednesdays and The W.H.O.L.E. Gang’s Friday Foodie Fix. We have all been saying it lately. The basil runneth over right now. I have it coming out of my ears and am adding it to everything – chopped in salads, sprinkled on chicken, added to pastas, and, of course, PESTO, PESTO, PESTO!! My boys (who are normally great lovers of all things basil) have officially informed me that they are tired of anything with “green sauce or green flecks”. I promised them I would go on a little basil hiatus if they humored me with one more meal involving it. I decided to change up my pesto recipe a bit and added pistachios (which are a favorite with my boys) and a quick squeeze of lemon. I spread it under the skin of some chicken, spooned a little more on top, and tossed in the oven for a bit and, viola! Dinner. Done. Even better, was that the boys thought it was great! The pistachios lent a very rich and luxurious taste to this dish. I even pulled off making it again when Heidi (of The Adventures of a Gluten Free Mom) and her family stopped over on their way to California. So although I am officially on a basil break, I wanted to share this recipe with you in case you have not quite maxed out on your basil intake! And for the record, I did just freeze a dozen mason jars filled with this pesto recipe so that I will have some on hand when the basil is not so plentiful and my kids are again itching for some “green sauce”. 2. While oven is heating, place shelled pistachios in a food processor fitted with a metal blade. Pulse until they are coarsely ground. Then add chopped garlic and pulse again a couple more times. 3. Add basil leaves and salt and turn the processor back on. While it is running, remove the food chute and pour the olive oil in a steady stream. Add the lemon juice and run the processor until your pesto has reached your desired consistency. Note: I like mine really smooth, so sometimes I have to add some additional olive oil. 4. Place chicken pieces in a large baking dish. Season it with some addition sea salt. 5. Loosen skin away from the meat of each of the chicken pieces. Place about a teaspoon of the pesto under the skin of each piece of chicken, taking care to not tear the skin. You can kind of squish the pesto under the skin from the outside using your fingers so that it is evenly under the skin, if you want (although not my favorite thing to do since I have had an aversion to feeling raw chicken in my hands ever since I was pregnant – will leave out details). 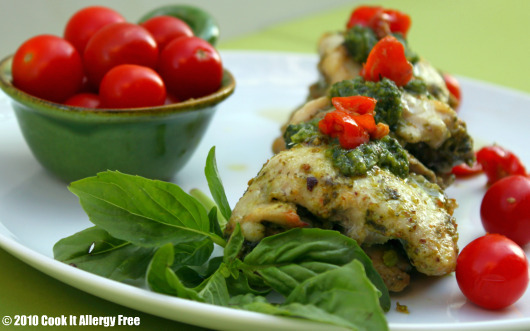 You can spread a little bit more of the pesto on top of each piece of chicken, if you want. 5. Place pan in the oven and bake for twenty (20) minutes. Then, place the cherry tomatoes in the pan around the chicken, and bake for twenty (20) minutes more, or until the chicken is cooked through. If you like your skin extra crispy, you can crack the oven open at the very end and turn the broiler on for about 2-3 minutes. Watch this carefully though since the chicken will brown FAST! 6. Serve with some additional pesto sauce, if desired, and enjoy! Do you make a variation to the traditional pesto sauce? What are some of the unique ingredients that you have added to your pestos in the past? Sounds like the perfect dish for GF visitors. Now I’ve gotta try pistachios in my pesto. Thanks Wendy! Makes it really rich tasting (but not in a too-rich way). Just gives it a bit of a flavor twist, especially with that little squeeze of lemon added in. I take the sqeeze basil and add olive oil and a touch of lemon juice. I can’t add much else because of allergies (all nuts, raw fruits and veggies so no tomatoes). Heat it up in a small pan or just add everything to pasta or couscous or whatever you are making. Katie, that is tough. Can you do sunflower or pumpkin seeds? Your version still sounds fresh, healthy, and delicious! I’m sure your pistachio pesto is fabulous – pesto is one of those things you can make however you darn well please. I’ve made it dairy free, with and without garlic, with lemon, without lemon…it’s pretty versatile. About the microplane – sometimes a chunk of garlic somehow escapes my food processor blade. It’s never pleasant biting into raw garlic; grating it first avoids the problem all together. Thanks for linking up to SIT!! Amy, yes! I love how versatile pesto is. On my Facebook page, I asked what some other ideas were and people came up with all types of fun additions! Makes me want to experiment some more. But, as I promised those boys of mine, we are going to steer away from the “green sauce” for a bit. lol But i will definitely be using my microplane for the garlic next time. Love that idea (even though I actually like hunks of raw garlic, hehehe). Thanks for another great round-up, by the way! Kim, no seeds for me but I just about the garlic and they have squeeze garlic for those who don’t like the chunks. Plus it’s faster than anything else. Your picture is amazing Kim! Gorgeous. I adore pesto and can’t imagine why on earth anyone would ever buy it 🙂 It’s so easy to make. We always use walnuts (never pine nuts) but I will definitely try pistachios. I’d also love to try cashews just to see what happens. Thanks for the inspiration! Thanks, Maggie! I agree on the fact that pesto is really the easiest thing to make – cannot tell you the last time I bought some pre-made. I love walnuts in my pesto too! And for a nut-free version, I also like the pumpkin and sunflower seeds. Cashews would be yummy too…oh, the possibilities. Shirley, we have had an unusually cooler summer than normal (sounds strange when it has still been in the 90’s, but that is a break from our summer heat). Basil has never done this well at this time of year. When we were in California, my mother-in-law’s basil was going crazy too!! She gave me a bunch more so that I could stock my freezer with pesto. Although, four cups is not as much as you would think, especially when the leaves are pretty large. By the way, I recently made lemon basil ice cream too from Nancy’s (Sensitive Pantry) recipe. It was the most refreshing dessert! Even the kids enjoyed it, which surprised me! This looks amazing! This new pistachio pesto flavor combo is popping up everywhere. I am admiring your blog. It is attractive and neat. I think, that is what a blog should look like. Don’t look at mine. I usually don’t make pesto because, I never have many cups of the spice. I only had one basil plant and it was fine for a little seasoning in dishes but not for pesto. Despite this, what a great chicken dish, this is. Maybe, in the future, I will have more of any spice. Using pistachios is a great idea! I’m glad the boys liked it. Mine have gotten tired of zucchini in everything, but my zucchini has slowed down. I’m so glad you participated in the pesto challenge. The chicken looks delicious! Excellent blog! I genuinely love how it’ s easy on my eyes as well as the info are well written. I am wondering how I may be notified whenever a new post has been made. I have subscribed to your rss feed which should do the trick! Have a nice day!